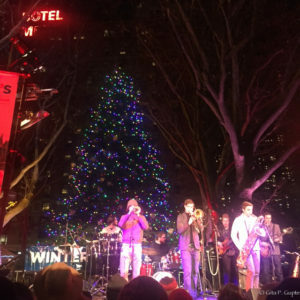 This year’s Lincoln Square Winter’s Eve Festival kicked off with the lighting of the Dante Park Christmas tree at 5:30pm. The party continued until 9pm as a cheery crowd traversed a nine block radius down Broadway and parts of Columbus Avenue. Donning Christmas glow sticks, the festival-goers experienced free concerts, the flavors of the neighborhood from Magnolia Bakery to Boulud Sud, and got a head start on their holiday shopping with discounts from local retailers. Perhaps most enchanting was Ikebe Shakedown, a six person Brooklyn based Jazz band, that soundtracked the evening with a delightful blend of trumpet, trombone, congas/drums, bass, and guitar. Playing songs from their new LP, Stone By Stone, they pleased a multigenerational audience of wool-capped, hot chocolate sipping New Yorkers. 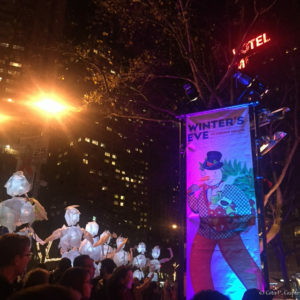 With the ambient brass and strings filling the air, larger than life puppets gracefully glided across the backdrop of Lincoln Center, circling Dante Park to create a magical experience fit for any Hallmark Channel Christmas movie. Winter’s Eve is sponsored by Time Warner and the Lincoln Square Business Improvement District. For more information visit: www.winterseve.nyc. This entry was posted in happenings and tagged holiday, new york city, winter's eve festival.